The Blue Nile river (known as Abbay in Ethiopia) drains the highlands of Ethiopia and contributes about 60 per cent of the annual flow of the Nile measured at Aswan in Egypt. The long-term average annual water yield of the sub-basin is approximately 50 BCM. 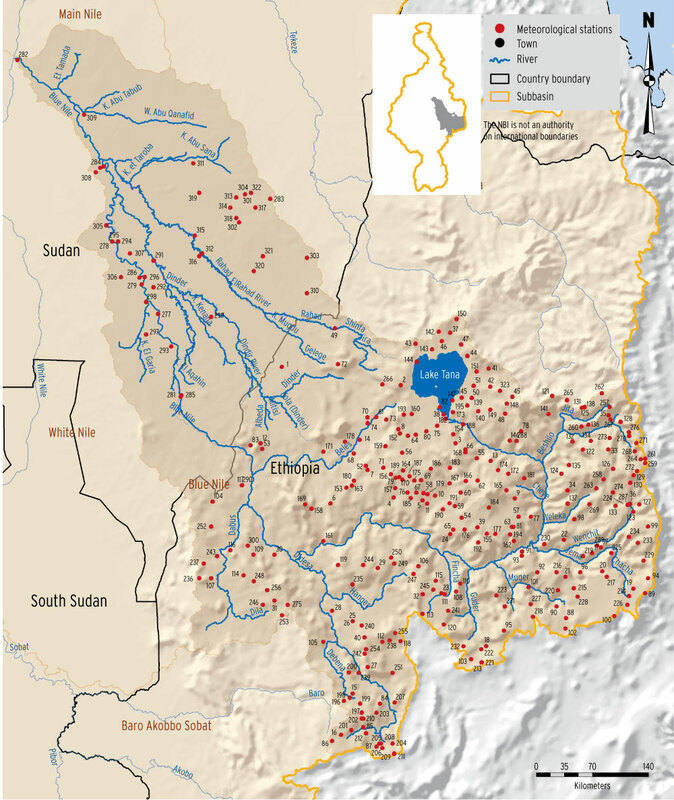 The Blue Nile is highly seasonal with approximately 70 percent of its annual flow occurring in just 4 months. The Blue Nile is source of water for major irrigation schemes in the Sudan. The Blue Nile causes severe flood damages in Sudan from time to time. The Grand Ethiopian Renaissance Dam (GERD) is under construction on the Blue Nile designed to store some 74 109m3. With the GERD in place, the Blue Nile will be fully regulated and its downstream flow depends on releases from the dam. This is expected to reduce flood damages significantly. There are opportunities for cross border collaboration on the coordinated management of the Blue Nile in which joint monitoring of river flows is an important component. There are 304 meteorological stations in the sub-basin, with 286 of them in Ethiopia and 18 in Sudan. The distribution of the stations is shown in the map below. 64 stations (53 in Ethiopia and 11 in Sudan) are reported to measure the full range of meteorological parameters and the rest 106 measure daily rainfall totals only. 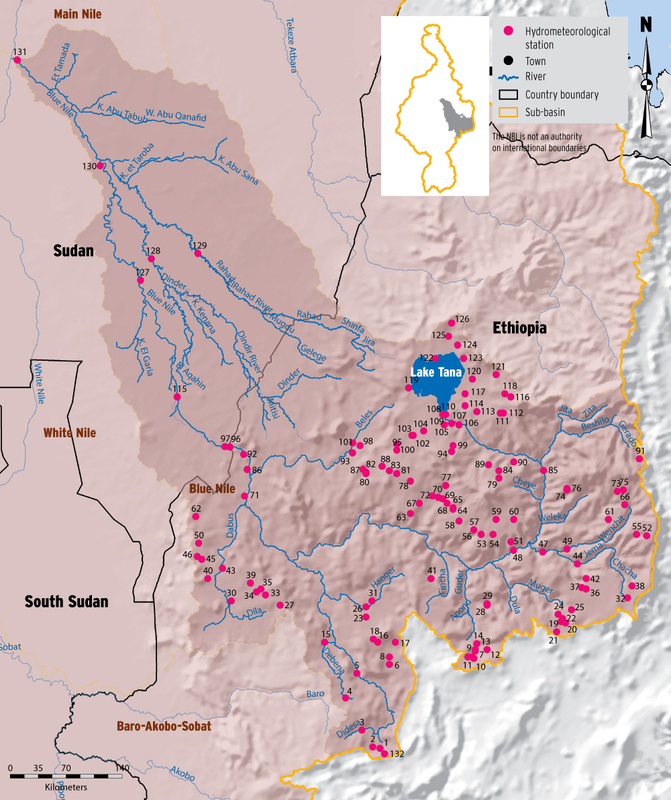 There are 133 hydrometric stations in the sub-basin; 126 in Ethiopia and the remaining seven in Sudan. The station just downstream of Ethiopia – Sudan border, the Diem station, has a record of over 100 years and, therefore, one of the most important. However, is due to the recent heightening of the Roseries Dam in Sudan, the station at times get inundated by the back-water of the dam. Most stations in Ethiopia were established in the early 1960’s. Erosion and sediment transport are also key processes in the sub-basin but not adequately monitored. The Blue Nile sub-basin offers one of the greatest opportunities for hydropower development in the Nile Basin. In addition, providing over 60 percent of the average annual flow of the Nile, the Blue Nile is the major source of water for the Nile. Key focus in strengthening of hydrometric monitoring system shall be on real-time data collection and transmission system, sediment monitoring and monitoring of river morphological changes downstream as a result of anticipated flow regimes in the sub-basin. 85 Abay at Mekane Selam-Gundewein Br.